Wizard Rock is located high on the south side of the canyon, just east of Avalon. 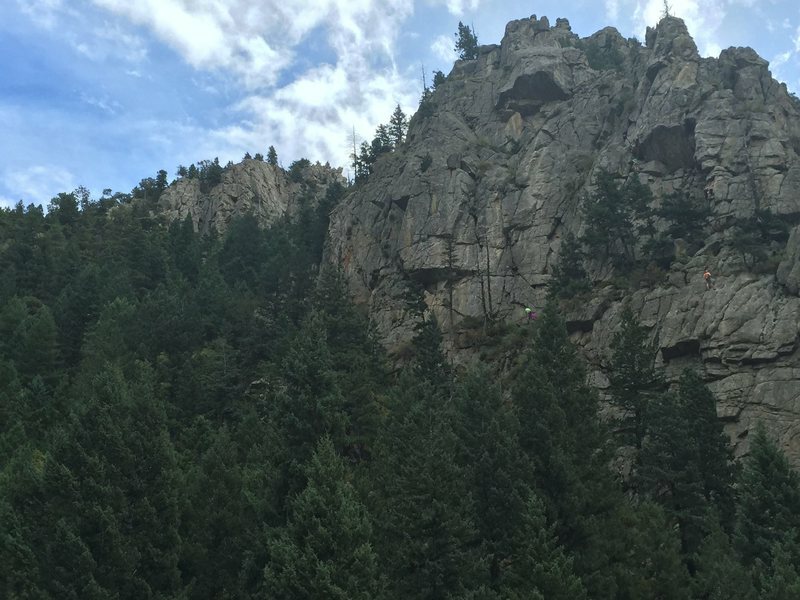 A fine destination for the Boulder Canyon climber who has done everything. A. Wide Jadodat, 4, 1p, 45', gear. B. Uncertain Fates, 8 R, 75', 1p, gear to 2". C. Christal Ball, 9, 1p, 70', bolts. D. Crack, 7, 1p, 80', 1p, gear to 3.5". E. Magic Wand, 8, 1p, 80', bolts. F. Wave Yer Wand, 6, 1p, 80', gear. G1.Ruff, 9 R, 1p, 90', gear or TR. G2.Snow Crash, 10, 1p, 90', bolts. H. Driven Like the Snow, 7, 1p, 95', gear. I. Right Arete, 7+, 1p, 130', gear. J. Wizard Shuffle, 5 PG-13, 1p, 95', gear or TR. K. Two in the Bush, 9 R, 1p, 70', gear or TR. L. Way of the Wizard, 8, 1p, 70', bolts. Approach from the east end of the big ledge atop the Third Tier of Avalon or from the top of Solaris. To descend, lower from ring anchors or walk off to the north and west. Way of the Wizard 9 *FA: R. Rossiter and Christine Damiano, 2001.This route leads to the top of Wizard Rock. Begin at the far right side of the crag, uphill and around to the right. Stem straight up a tricky dihedral, gain the main slab, and continue to the top. 8 bolts to a 2-bolt anchor, 85 feet. Wizard Rock is a secluded spot with four moderate (8 to 10b) bolted routes. Most of the routes face west and get morning shade, making Wizard Rock a good hot-weather destination. All the sport routes can be done with a 50m rope and a set of quickdraws. The easiest approach is from Avalon. Cross the creek by the Avalon tyrolean traverse, go up the talus field, and head up and right to the Wall of the Dead. Go around this to the right and up to the summit tier of Avalon. Traverse left under Avalon's summit tier heading downstream. Pass a short wall with several cracks (Wall of the Goddess) and continue into the woods on a trail right next to the rock. Break into a clearing, cross a gully, and you arrive at Wizard Rock. The first route you see starts just past a fallen log and goes up a clean, blocky arete above a tree stump (Snow Crash, 10b). The second route starts twenty feet left of Snow Crash and goes up a blunt buttress (Magic Wand, 8). The third route starts twenty feet left of Magic Wand, on a narrow buttress with three blocky overhangs (Christal Ball, 9). The fourth route is up the gully to the right of Snow Crash, and starts at a short steep corner with a black streak, just right of another tree stump (Way of the Wizard, 9). Richard Rossiter has done two additional routes on Wizard Rock: Right Arete and Way of the Lizard. It would be great to incorporate these routes into the Wizard Rock area description. See boulderclimbs.com/wizard.html. HOW TO FIND WIZARD ROCK: here is how to find this obscure but worthy feature: there are two ways: (1) via the main route up through the Wall of the Dead trail, or (2) a more roundabout (but more educational) route via Solaris. (2) VIA SOLARIS: navigate to Solaris. Once there, continue up and left, past the rock, and achieve a sort of summit plateau with vistas to the east down Boulder Canyon, but turn right and continue uphill through well-spaced pine trees and lightly bouldered land until at some point it feels like you've gone too far, and you seek a descent down and right through a weakness in the skyline to the right, and descend downward and northwards...until you encounter some rock, and start to hug that wall. Congratulations, you've found Wizard Rock via Solaris! (1) To find it via the "easier way" (as originally described in this page): access Avalon's Wall of the Dead. Continue on this trail, up and right, to the base of the upper 3rd Tier(?) of Avalon, and begin a long trail that hugs the base of the various cliffs between there and Wizard Rock. This is quite an extended traverse, from right to left (or west to east), which eventually leads you to Wizard Rock, the highest feature in the Avalon area. See the associated photo for a valuable situational awareness...Wizard Rock is the formation in the background, taken from the highway, just a little east from the tyrolean. Wizard Rock visible from the road, taken a little east (down canyon) of the tyrolean.